Hong Kong MTR Train Safety Tips! Be aware and informed for this train safety tips while boarding or getting on and off from the mtr trains in Hong Kong. Make certain that you read and understand this standard Hong Kong MTR Train Safety Tips to avoid any inconvenient in your journey or even worst to getting injuries. Please follow these detailed safety information. Always stay behind the yellow line. Queue up inside the yellow box. Never stand in the red box. Never go beyond the ends of the platform. Avoid standing at the edge of the platform. Call the Platform Supervisor for help if something falls into the tracts, never try to get the item yourself. In Case of Emergency, press the Emergency Train Stop button. Give way to the alighting passengers before boarding the train. Always aware and mind the platform gap. Stop boarding or alighting when the door closing signal sounds. Never block the train doors while closing. Take special care of children and the elderly. Do not put your hands on the train door gap. Keep distance from the train doors. Stay at the middle of the train when seats are occupied. Always pay attention to the train announcements and electronic message boards. Pay attention and always follow the traffic lights, cross only when the light is green. Look to your left and to your right for any approaching vehicles before crossing. Do not cross when you hear the bell or horn sound of the Light Rail vehicle. 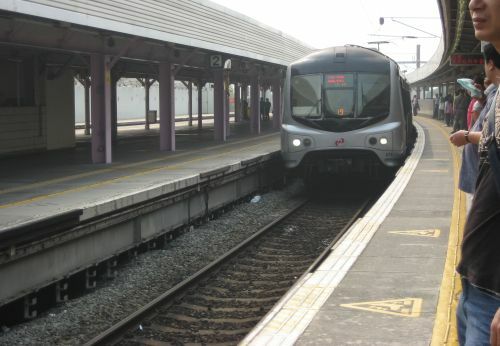 Important Train Safety Tips: Do Not walk on the MTR tracks at any time. There's no way out of the stations along the track area. Take note of the signs in all East Rail Station Platforms that remind all passengers never to enter MTR tracks areas. If in case you drop something in the train tracks, notify any station staff immediately and they will get it for you. Do Not risk your life by entering into the train track! See more on thka's Site Updates here.